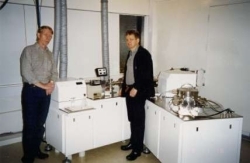 NORDVULK runs a Nu-Instrument double focusing multicollector mass spectrometer with a plasma source. The instrument is operated with a microconcentric nebulizer and the required amount of analyte is about 0.1-0.2 micrograms. The instrument and a clean-lab facility is currently set up for analysis of Sr-Nd-Hf-Pb isotope ratios in volcanic rocks and Th isotope analysis in young volcanic rocks. Our volcanological approach to isotope geochemistry aims at characterising mantle sources of basalts and internal relations of evolved rocks as well as detecting magma mixing and assimilation by isotopic methods. Sample preparation methods currently in use are based on separation of Sr-Nd-Hf-Pb and Th from a single powder sample but the U/Th ratio is measured on a separate spiked sample. Initial sample size depends on the least abundant elements to be measured, usually lead or thorium. Analysis are prepared in batches of 16 samples and the turnaround time for preparation and measurements of the above elements is about two weeks. Chemical separations for the ICP-MS isotope analysis are both group separations and isolation of single elements. Hafnium is not separated from zirconium and Nd is measured in a clean REE fraction. Strontium, thorium and lead are measured in virtually clean solutions. Dissolution of rock chips or powder is made in hydrofluoric-nitric-hydrochloric mixture. After evaporation of silicon tetrafluoride the solid fluorides containing Sr, Pb, Th and REE are separated by centrifugation in cold HF. The soluble fluorides are evaporated and Hf together with Zr is separated by two column ion exchange procedure. The fluoride precipitate is evaporated in nitric acid and boric acid and taken up in 8M nitric acid. Thorium is collected on anion exchange resin from the 8M nitric acid and eluted with water. Strontium is separated from a small diluted aliquote of the 8M nitric acid on 3M Empore Sr-selective filter. The 8M nitric acid effluent from the Th separation is evaporated and taken up in 1M hydrobromic acid from which lead is collected as bromide on anion exchange resin and eluted with 6M hydrochloric acid. The effluent from the lead separation is diluted with 2.5M hydrochloric acid and the REE are collected on cation exchange resin and eluted with 8M nitric acid. Samples for uranium and thorium ratio measurements are spiked with 230Th and 233U and the elements are collected together on anion exchange resin from 8M nitric acid after dissolution in hydrofluoric, perchloric and nitric acid. All separated material fractions are evaporated in nitric acid and taken up in 1% nitric acid for analysis.